Over the weekend, the Flavor Team took a trip up to Paso Robles to try some new wines. As we continue our studies of wines around the world (we share a bit of our European Wine Class experience at Cal Poly in this article), we are learning more about Bordeaux, France. Bordeaux is famous for its Right Bank region, which features Merlot-centered blends, while the Left Bank focuses on the deep, rich Cabernet Sauvignon varietal. 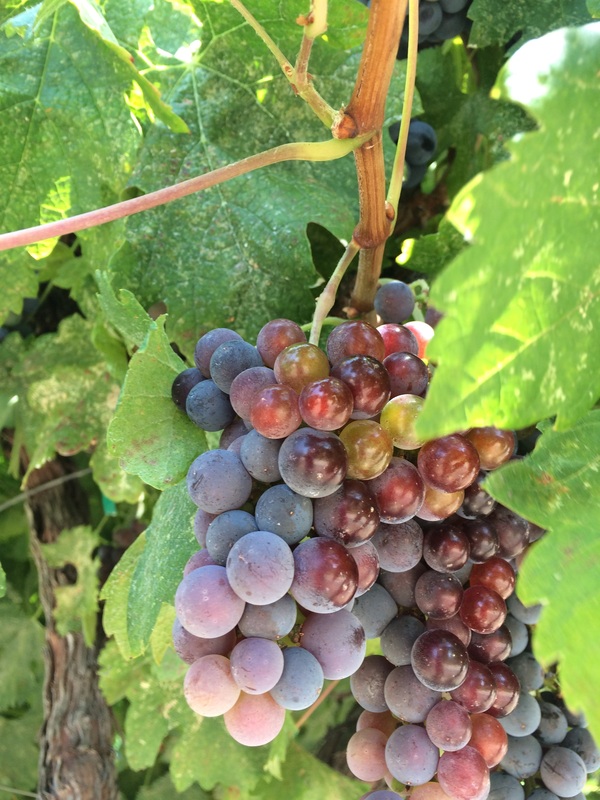 HammerSky Vineyards in west Paso Robles focuses on Bordeaux varietal wines and red blends with a little California flavor. 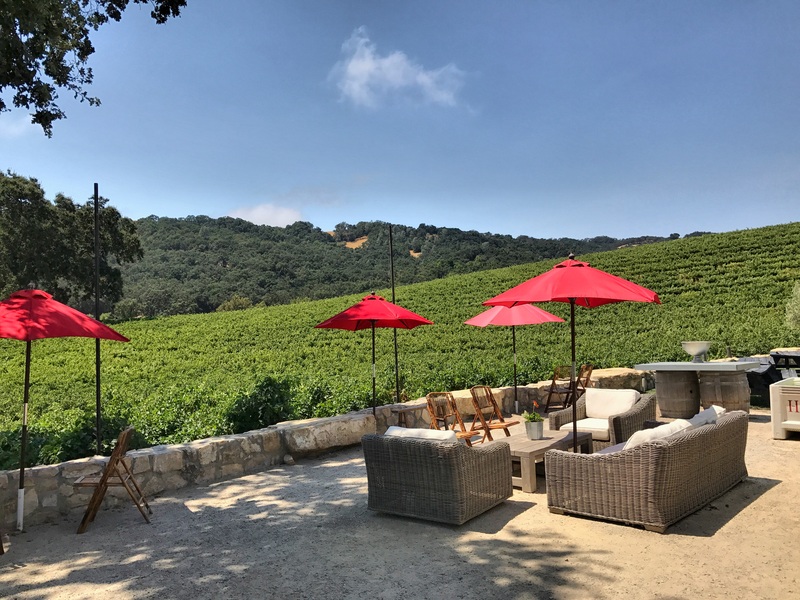 Our tasting included both 100% varietal wines of Merlot, Cabernet Sauvignon, and Zinfandel (not a Bordeaux varietal) along with some interesting blends to feature the local winery and methods. Varietals: Reds: Merlot, Cabernet Sauvignon, and Zinfandel, and a blend with Petite Syrah. Whites: Sparkling. 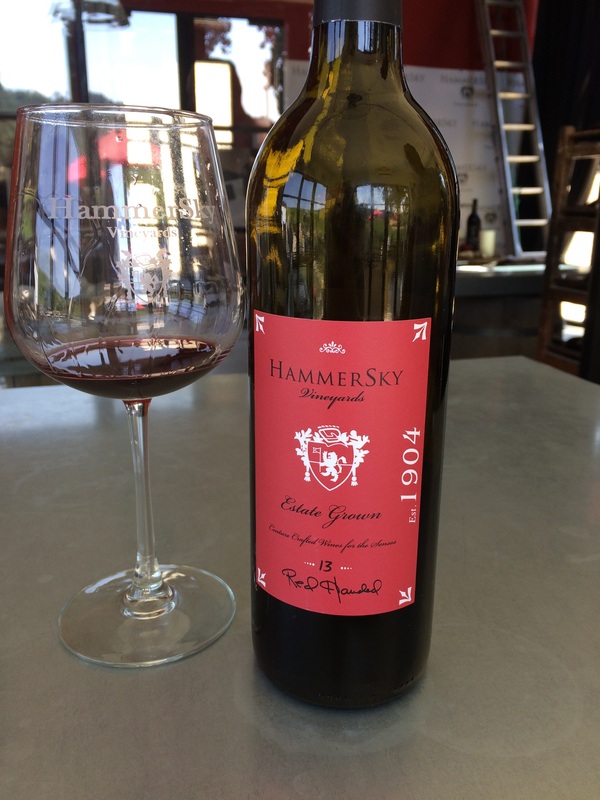 HammerSky Vineyards, named after the owners’ sons Hamilton and Skyler, creates Bordeaux-focused wines in west Paso Robles. Julianna was our tour guide through the tasting tour at the small but airy HammerSky tasting room. Here are a few of our flavor notes that stood out as we worked our way through the wine list from our different perspectives, noted by our initials (ab) and (ks). An interesting feature that HammerSky offers is its Infinity Glass program. You buy a glass of wine and keep the glass. Then, each time you bring it back, you get a free tasting. Now, on to our tasting. (ab) This is a nice light sparkling wine with hints of apple, tree fruit, and a dry finish. The bubbles were very subtle and did not add to the texture or taste. I could see a chilled bottle of this while sitting outside on the HammerSky patio while in the shade a nice way to pass the time. (ks) I found this intriguing, as the carbonation abated pretty quickly and left me with a nice, dry white wine. We didn’t find out what grape(s) were used in making Detained, but it had a deeper yellow hue than some sparkling wines, and a pronounced taste of honey on the finish. It would be a great wine to enjoy on warm summer Paso Robles afternoon. Most of HammerSky’s wines are from estate-grown grapes, including this Merlot. (ab) This wine is a blend of 35% Merlot, 35% Cabernet Sauvignon, and the remaining 30% Petite Syrah. A nice dark maroon color with hints on the nose of sweet tart and raspberry. The taste was a nice balance of red fruit and hints of oak and minerality. Neither were overpowering and added well to the overall taste. There was a one element of the blend that really stood out, and we did not really put our finger on it until we tasted our next wine: the 100% Cabernet. Would be interesting to see what higher percentages of Cab or Merlot would bring out, as they are Bordeaux grapes. In this case, the Cab may be the delicious front runner. (ks) As Andrew mentioned, this is a nice blend of two Bordeaux grapes with the addition of Petite Syrah. SweetTart candy jumped out at me from the glass, and the soft tannins allowed the spiced berry flavors to come through. It’s enjoyable now, being a 2013, and might even get a bit better in a year or two. (ab) We tasted Cabernet Sauvignon right after the Party of Four blend. It was quickly noted where the amazing element to that blend (from my perspective) came from this grape. The nose was amazing on this wine, with hints of black cherry and vanilla without being a too sweet smell. The taste did not disappoint with bright acidity and the same flavors of “deep” raspberry, slight minerality, and some vanilla tones. The 2017 harvest at HammerSky promises to be a great one. 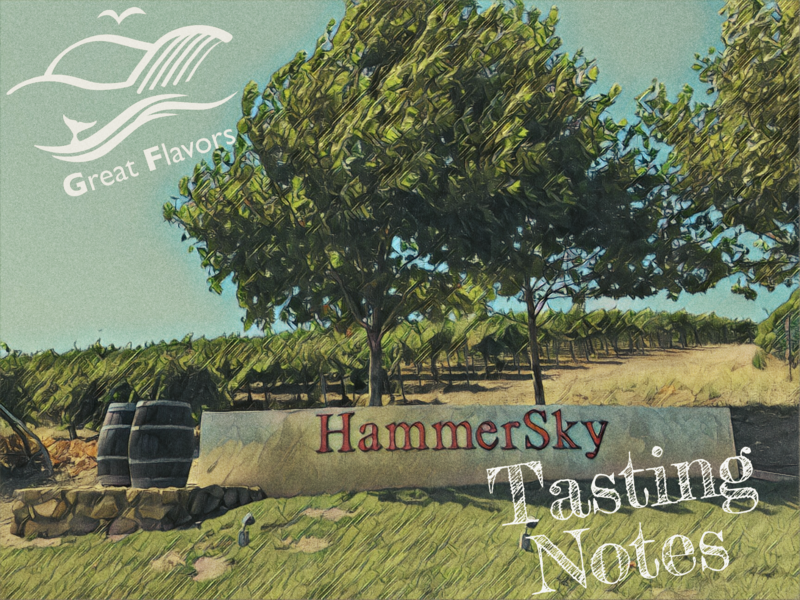 We went back to a side by side tasting with the Cabernet Sauvignon and the Party of Four and these are two delicious standouts at the Hammer Sky Winery. (ks) This deep ruby wine started with a tantalizing black-cherry cola aroma and strong but balanced tannins and nice dark berry flavors. After we were finished tasting the flight at HammerSky, we purposely asked for revisits of this Cab alongside the Party of Four. It was there that the Cabernet stood out as the defining feature of the Party of Four. (ks) This 100% estate Merlot started with a medium to dark red hue in the glass with a nice nose of tart berries, like cranberry and raspberry. It had fairly high tannins but was well balanced with acidity and a nice element of minerality. I noted some leather as the wine opened up a bit. While it wasn’t my favorite, it was a good wine. (ks) Another of HammerSky’s 100% estate grown wines, the Zinfandel had an incredible, smile-inducing nose. Dark, spiced berry melded with a bit of vanilla made for a enjoyable Zin. Very flavorful and balanced and not a fruit bomb. HammerSky’s tranquil patio, overlooking the vineyards and the historic 100+ year old farmhouse, which now serves as guest lodging. 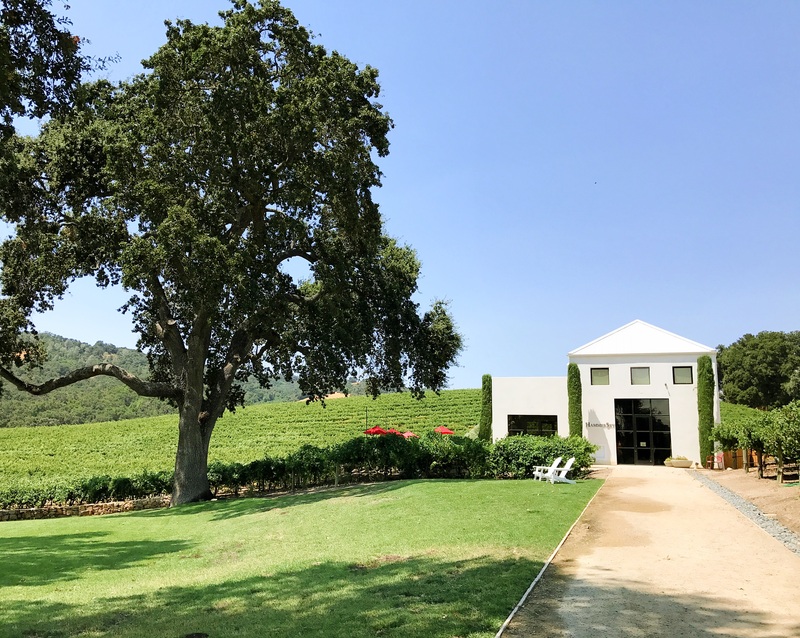 The HammerSky tasting room, located along Vineyard Drive in Paso Robles, feels open, inviting, and is the perfect place to have a glass of wine and take in the rolling hills overlooking the vineyard and quaint buildings. We encourage you to try it for yourself and let us know which wines you liked and your experiences here. If you enjoyed this article don’t hesitate to give us a “like” and leave a comment below or on Facebook.